Jaxson bounces off backs of trainers to snap up a Frisbee. Reason #5--My mother-in-law and I snagged front-row seats for a free performance by Frisbee dogs, officially the Disc-Connected K9s. I am addicted to puns, but that one even had me groaning. The dogs really strutted their stuff, though. 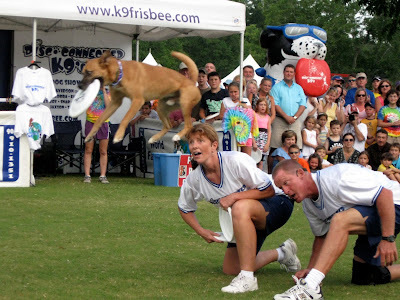 The canine performers chased and caught the plastic discs, showing off a repertoire of leaps, twists and flips over, under and around their trainers. Their acrobatics were surpassed only by their obvious enthusiasm for the complex game of fetch. Reason #4--Three teams fired up their vivid balloons for display. The increasingly gusty winds soon had them deflating the balloons and packing up for the day, but I appreciated their effort. There is just something so happy about those balloons, even when they are earthbound. Reason #3--The pace was relaxed and friendly with families tossing Frisbees, toddlers wrestling souvenir “hot-air” balloons almost as big as themselves, and the occasional aromas from the food booths wafting our way. Reason #2--My thoughtful husband brought out camping chairs, sandwiches, watermelon and fresh strawberries for a delicious picnic in the grassy field reserved for the balloons that would have been on display had weather permitted. Reason #1--Clouds and a storm front banished the unusually high temperatures that we have been having since May. Ahhhhh, cool, the ultimate outdoor summertime amenity. Well worth the trip! 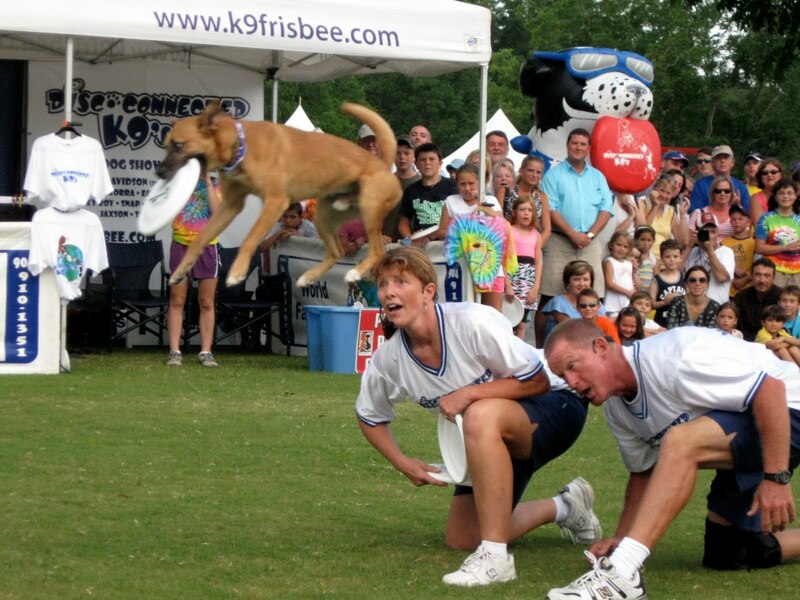 fabulous action shot of the frisbee dog! When life hands you lemons you make lemonade. Love your attitude and all the fun you had inspite of the weather problems. Great pics. too.